Independent waste management group CSG, whose business includes a major off-mains drainage maintenance operation, plans to deploy a new “potentially life-saving” device specifically designed to prevent falls into open septic tank manholes. Septic tank clearance is one of CSG’s core activities. Each year, the company’s 45 specialist drivers carry out around 55,000 tank clearances, sometimes in remote rural areas where the operatives usually work unaccompanied, often when the customer is not at home. “Working over open manholes means there is the potential for the operator to fall into the pit. Many of these pits are deep and with an oxygen depleted atmosphere. There is also the possibility of hitting your head during the fall, and there is rarely a means to climb out, so a device like this can potentially safe lives,” said Mr Mooney who designed and built the prototype himself. Accidents of this kind were very rare and CSG had never experienced one, he said. But there had been a number of fatal septic tanks falls reported from around the world. “But effective health and safety programmes are not just about responding to known accident statistics. It’s just as important to anticipate potential problems and devise the methods to prevent them before they happen. Fareham-based CSG has had the device independently load tested and certified by independent experts SWL Rope Lifting & Testing Ltd. and now plans to produce a full user guide for drivers and arrange manufacture of the device which will then be included as standard equipment on all its of vacuum tankers. 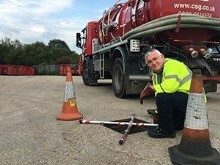 Image Caption: CSG health & safety expert Kevin Mooney demonstrates the new manhole safety device he designed to prevent septic tank accidents.